Turns out that our harsh winter isn't just 'our' harsh winter. Vancouver Island marmots, a critically endangered species that's being actively managed to recover the species from the brink of extinction. 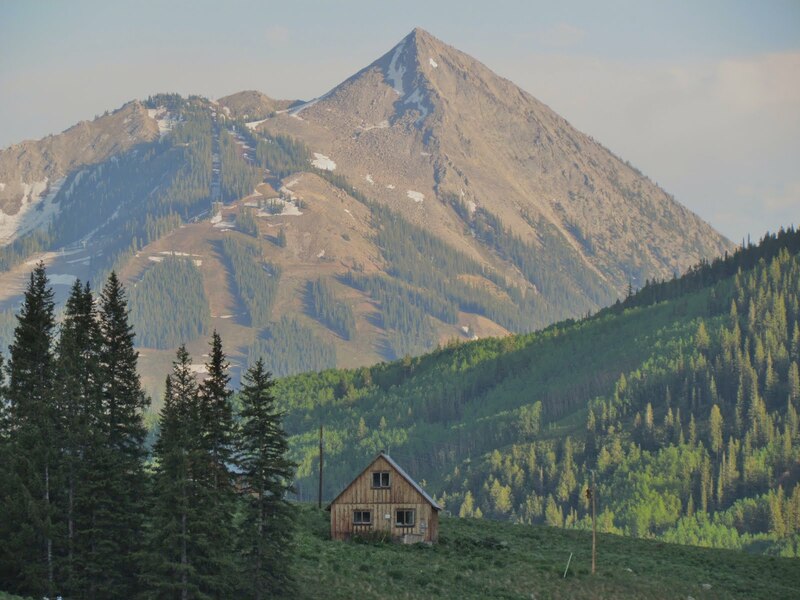 A recent newspaper article describes the problems that the recovery team has faced this summer: too much snow, bad weather, and an inability to re-introduce captive-born marmots. Fingers crossed. The recovery, to date, has been successful, but setbacks could be profound this summer. Greetings marmot fans! 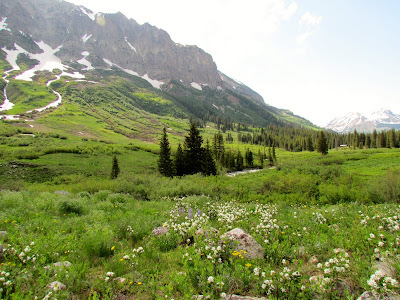 I am an undergraduate from Lake Forest College near Chicago, IL, working at the Rocky Mountain Biological Laboratory this summer with Team Marmot. This is me and my science face. Under the guidance of my mentor, Matt Petelle, I will be studying what affects the repeatability of personality in marmots. Personality by definition is repeatable across time and context. However, we know that many factors can affect how an animal responds to a given personality test, which therefore affect the repeatability. My work will examine the effects of microhabitat and habituation on tests of boldness and exploration in the yellow-bellied marmots near RMBL. 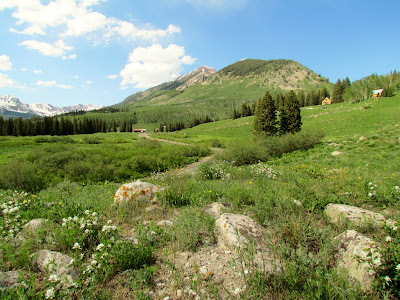 Since I arrived in the beginning of June I have learned how to take down social observations and help with weekly trappings including painting dye marks on marmots backs. Recently, I have begun my experiments to measure personality traits. The test for boldness involves me walking very slowly at marmots and recording the distances when the marmot notices me and when he escapes to his burrow. This is known as a flight initiation distance test. To measure exploration, I use a novel object test. This test involves placing an object that marmots have never seen before (in this case, a floaty zebra toy named Ezekial) outside of a burrow with a bit of bait in front of it. 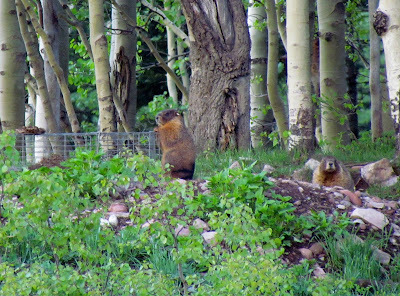 I then record the activity of the marmots while they forage at the bait. The proportion of time spent looking for predators versus time spent foraging gives a measurement of how adventurous each marmot is. The marmot, 3, in a drainpipe in Gothic. I am having an excellent time so far, and I am looking forward to working against the weather to get lots of data in the name of science! Hi! My name is Malle (pronounced Maya). I am a biology student at Baylor University in Waco, Tx, and am enjoying the opportunity to not only do research with great people at RMBL, but also avoid the hot, humid weather! Back home I enjoy being a member and officer of a national sisterhood, biking down the river to Cameron Park, travelling, and being a supplemental instructor for physics (a lot more fun than it sounds). I am usually found in the beautiful Baylor Sciences Building working in Dr. Stephen Trumble’s Lab of Ecological and Adaptational Physiology (LEAP) as an undergrad assistant. I have been helping his graduate student, Rebel Sanders, with her Master’s thesis - assaying baby salmon for effects of certain hatchery chemicals. It’s pretty neat research. I’ll get to continue that work this semester as well as help an ecology Master’s student with his field studies – bring on the herptiles! Now, I’m thrilled to have my own research project! I am asking the question of whether the mule deer found in this area respond to marmot alarm calls. A fascinating part of animal behavior research is fear responses and how those are developed. 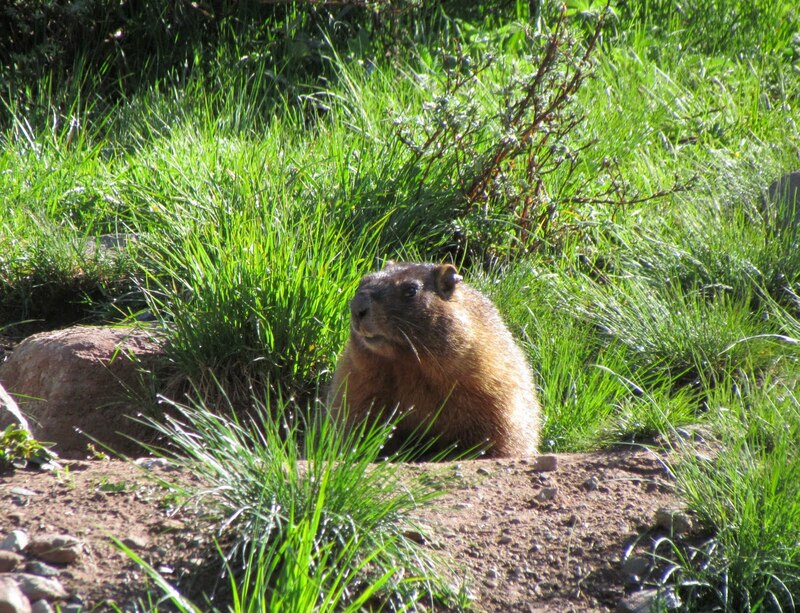 Here in the valley, coyotes and foxes prey upon yellow-bellied marmots. Coyotes, especially, can be a nuisance for the young deer and fawn, too. It would be interesting to see if the mule deer have a separate response to marmot alarm calls versus the control, the crowned sparrow song. Furthermore, if there is a response in the deer community, I am also curious to know if there could possibly be a greater one from females that have fawn nearby. Deer are cute creatures, but they have a very early wake up time. I can usually be found heading out to the “deer highways,” commonly used deer trails, at about five in the morning. I spend a majority of the time on the “hunt” looking for these camouflaged characters. Once I find one, I do all I can to get a behavioral observation before the deer bolts! Let’s just say some days are more successful than others. On the bright side, being up so early means I get a head start on the day, hear many of the morning birds, and greet the sun as it crests over the mountains. Over the past decade or so, we usually have our first litters of pups emerge from below ground the last week of June. By July 4th, we're up to our ears in pups. 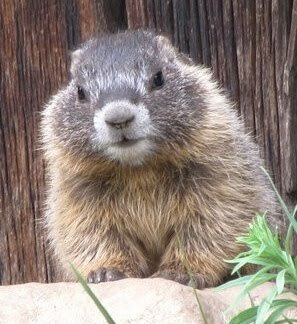 This year, in which the marmots had a VERY late start, continues to be an exceptional (and not in a good way!) year. Our first litter emerged after 4 July and we're still looking for another one! In the past decade we've had as many as 187 pups to catch at emergence. But this year, with some luck, we hope to have as many as 14 litters but that depends on a lot--the mothers not reabsorbing their embryos because they were in poor body condition after the long winter, and predators like weasels not killing the pups before they emerge. Another real issue is that we have been seeing a lot of adult females not breeding. Why? Well, as they say, a shortage of good men. Some groups had all the male marmots die and there was nobody to mate with at the end of a long winter. Interestingly, the first litter to emerge was one where the male hibernated with two adult females...they didn't have to emerge through 3 meters of snow to mate (they lived in an avalanche corridor and Julien was watching them earlier in the year as an avalanche approached them...they ducked out of the way!). I'm sure we'll have more pups soon, but the wait is killing me. I'm concerned that the whole valley will pop at the same time (typically the lower elevation sites emerge about a week or so before the upper elevation sites emerge)...which will create some challenges to trap them all at emergence. Ahh, life in the mountains...unpredictable yet still exciting. July is here and it is officially summer at RMBL. Most of the snow has melted from the mountains and this water is helping to turn the landscape green. The vegetation is now growing, waterfalls are rushing, and flowers are blooming. 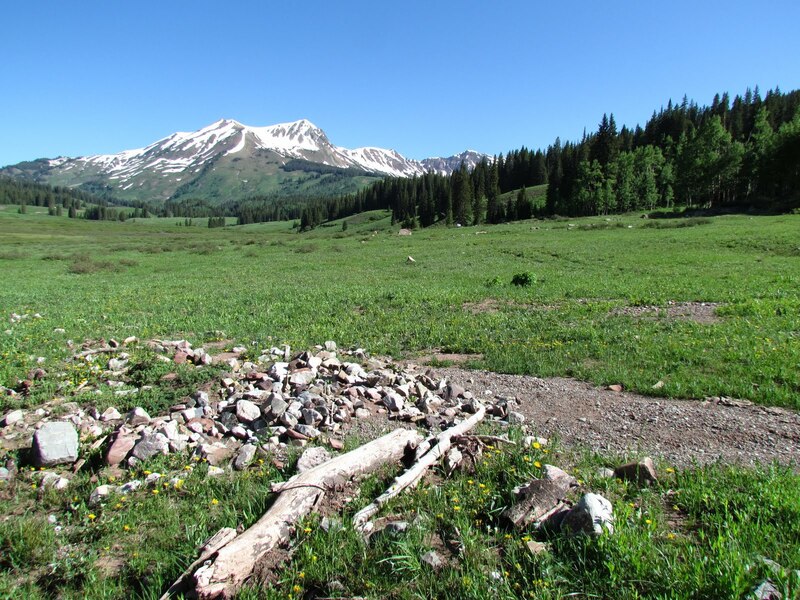 Marmots enjoy the benefits of this extra cover because it provides them with new opportunities to forage. 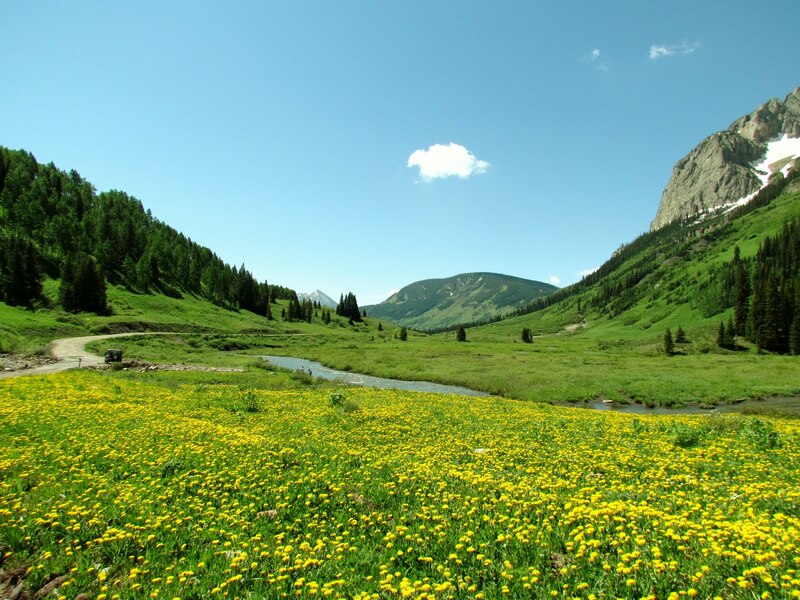 They also use tall vegetation, such that shown below, to seek protection when faced with predation risk. 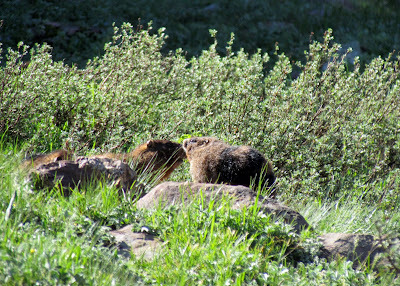 Of course, because this extra food brings multiple marmots out of their burrows to forage at once, marmots are also spending much of their active time socializing with their group-mates. We paint a unique dye mark on the back of each marmot to keep track of which animal is which. For example, you can see "Y" is the adult female on the rock in the middle of the photo below. 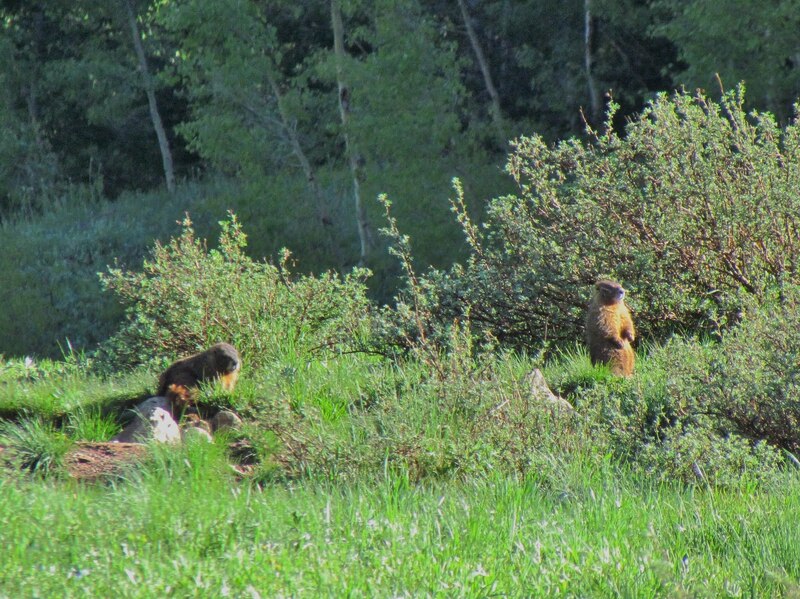 Team marmot is now busy recording social behavior and trapping marmots from our study population. 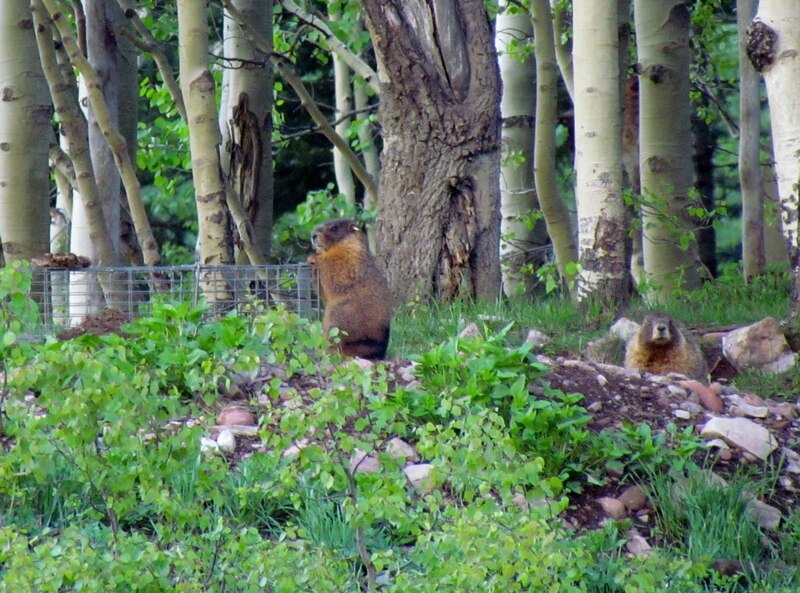 However, not all of the marmots are easily convinced that they should go inside of our traps! Luckily, for Team Marmot, our days in the mountains are long, so we can take full advantage of this active time to collect data and spend many hours surrounded by beautiful scenery. Yes, the life of a marmoteer is certainly rough these days.